Tropical Storm Isaac still lacks organization in its inner core and limited strengthening is expected before the cyclone begins to interact with Hispaniola in the next 24 hours. Isaac is forecast to change little as it moves over portions of Cuba, but has opportunities to strengthen once it moves over the Straights of Florida and into the Gulf of Mexico. This image was taken by GOES East at 1315Z on August 24, 2012. Hurricanes and tropical storms since 1851, as far as we can tell. A new map done up in glowing colors reveals the swirling paths hurricanes and tropical storms have tread across our planet since 1851. If it looks a little odd at first, it's because this hurricane map offers a unique perspective of the Earth; Antarctica is smack in the middle, and the rest of the planet unfurls around it like the petals of a tulip. The Americas are on the right, Asia is on the left; the storms plotted on the map grow brighter as their intensity increases. Here are 33 years of hurricane seasons lobbed into a bloated and clunky animation (it may take a few moments to fully paint in) : only retained the newest 33 years of data, sourced form the original visualization of hurricanes since 1851, to get a baseline sense of activity all over the globe (collection was less consistent in earlier years). The effect is not only informative — more than 150 years of hurricane data show that certain regions are consistently in the storms' crosshairs — but also arresting. 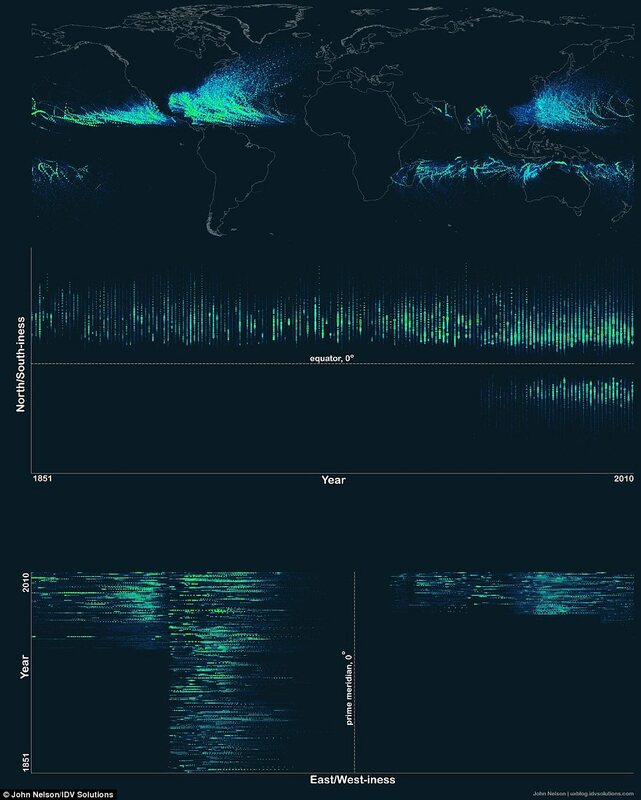 This test image reveals a timeline visualization of where storm data is collected around the world. Mapmaker John Nelson, the user experience and mapping manager for IDV Solutions, a data visualization company, said that this oddball point of view was the best way to tell the story of the data. "When I put it onto a rectangular map it was neat looking, but a little bit disappointing," Nelson told OurAmazingPlanet. But the unorthodox, bottom-up perspective allowed the curving paths the storms make across the world's oceans to shine, he said. Nelson used U.S. government data on tropical storms and hurricanes from 1851 through 2010. A quick glance at the map shows that the number of storms leapt up in the latter half of the 20th century, though that's because of technological advances. With the advent of satellites and hurricane-hunting aircraft, officials at the National Oceanic and Atmospheric Administration began to see storms that their predecessors in earlier ages would have missed. The storm is producing thunderstorms and strong winds. 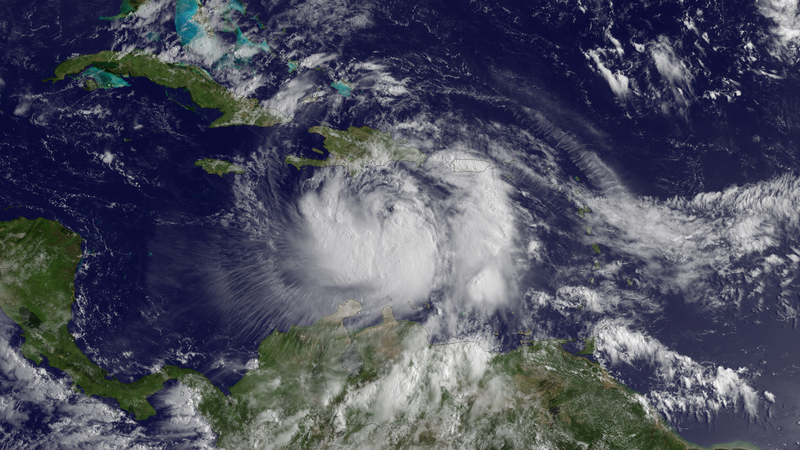 Hurricane Chris, the first of the 2012 Atlantic hurricane season, is a perfect example. That storm stayed far out to sea from birth to death, and likely wouldn't have made it into the record in the first half of the 20th century. In addition, the dearth of storms in the Eastern and Southern Hemispheres is also a product of a lack of data. The United States began to add storms from these regions to the archive beginning only in 1978. 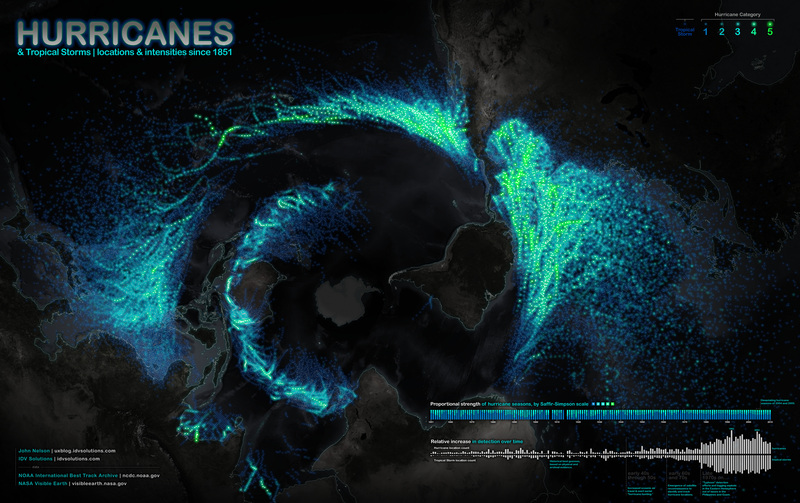 The hurricane map is the latest in a series of maps Nelson has made that showcase the planet's natural phenomena in arresting ways. More than 100 years of earthquakes glow on a world map. A map of the world's earthquakes since 1898 and a map of the rise in U.S. wildfires since 2001 also offer unique, wide-scale looks at natural disasters. Could man-made clouds halt global warming by reflecting sunlight? Researchers are exploring a controversial idea that uses ships to shoot saltwater high into the sky over the oceans, creating clouds that reflect sunlight and thus counter global warming. University of Washington atmospheric physicist Rob Wood is urging the scientific community to explore the possibility of seeding clouds to reflect more sunlight, saying that ethical ramifications - such as what would happen if a government used weather-changing technology for political reasons - should not be a barrier to research. His paper, published this month, looks at kind of ship would be best to spray the salt water into the sky, how large the water droplets should be and the potential climatological impacts. Wood describes ways to run experiments to test the concept in a paper published this month in the Philosophical Transactions of the Royal Society. Wood said that, with enough interest in cloud brightening from the scientific community, funding for an experiment may become possible. Wood aims to encourage more scientists to consider the idea of marine cloud brightening and even poke holes in it. The theory behind so-called marine cloud brightening is that adding particles, in this case sea salt, to the sky over the ocean would form large, long-lived clouds. Clouds appear when water forms around particles. Since there is a limited amount of water in the air, adding more particles creates more, but smaller, droplets. This creates a cooling effect on Earth. Marine cloud brightening is part of a broader concept known as geoengineering which encompasses efforts to use technology to manipulate the environment. Brightening, like other geoengineering proposals, is controversial for its ethical and political ramifications and the uncertainty around its impact. But those aren't reasons not to study it, Wood said. 'I would rather that responsible scientists test the idea than groups that might have a vested interest in proving its success,' he said. The danger with private organizations experimenting with geoengineering is that 'there is an assumption that it's got to work,' he said. 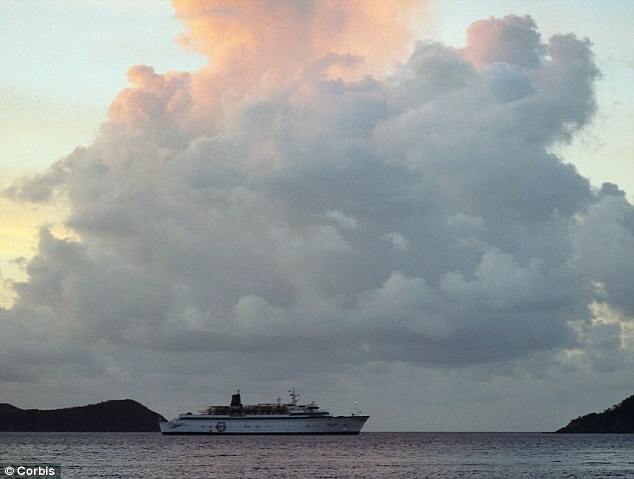 A phenomenon that inspired marine cloud brightening is ship trails: clouds that form behind the paths of ships crossing the ocean, similar to the trails that airplanes leave across the sky. Ship trails form around particles released from burning fuel. 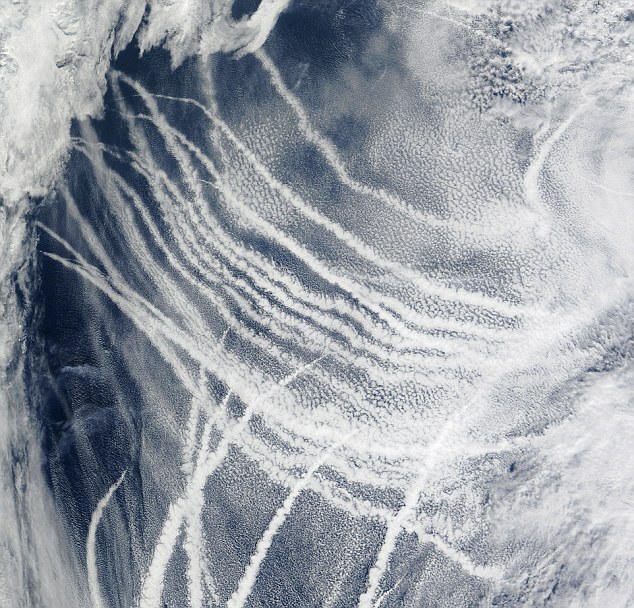 But in some cases ship trails make clouds darker. 'We don't really know why that is,' Wood said. 'It's a quick-fix idea when really what we need to do is move toward a low-carbon emission economy, which is turning out to be a long process,' Wood said. 'We stress that there would be no justification for deployment of [marine cloud brightening] unless it was clearly established that no significant adverse consequences would result. There would also need to be an international agreement firmly in favor of such action,' they wrote in the paper's summary. The test should start by deploying sprayers on a ship or barge to ensure that they can inject enough particles of the targeted size to the appropriate elevation, Wood and a colleague wrote in the report. An airplane equipped with sensors would study the physical and chemical characteristics of the particles and how they disperse. The next step would be to use additional airplanes to study how the cloud develops and how long it remains. The final phase of the experiment would send out five to 10 ships spread out across a 100 kilometer, or 62 mile, stretch. The resulting clouds would be large enough so that scientists could use satellites to examine them and their ability to reflect light. Wood said there is very little chance of long-term effects from such an experiment. Based on studies of pollutants, which emit particles that cause a similar reaction in clouds, scientists know that the impact of adding particles to clouds lasts only a few days. A close-up of an Ocean Sunfish (Mola mola). Did you know that mola are the heaviest of all the bony fish, with the largest specimens reaching 14 feet (4.2 meters) vertically and 10 feet (3.1 meters) horizontally and weighing nearly 5,000 pounds (2,268 kilograms)? The remarkable ability of Internet users to make a post go viral has produced a new treat: an enchanting picture of a Mola mola, or ocean sunfish, undulating just below the surface of the ocean. The image, snapped by photographer Daniel Botelho in 2010, is now making waves around Facebook. The attention might be focused on the one image for the moment, but sunfish are worth learning about in their own right. National Geographic spoke to Dr. Tierney Thys, who in addition to being named a National Geographic Explorer, is both founder and director of the Ocean Sunfish Tagging and Research Program. 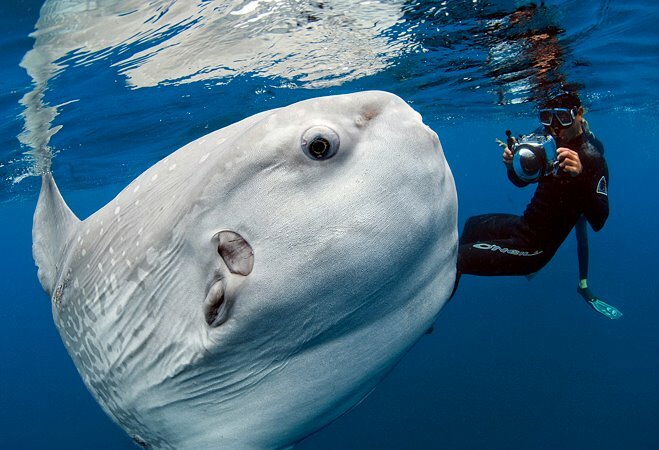 Marine biologist Tierney Thys asks us to step into the water to visit the world of the Mola mola, or giant ocean sunfish. Basking, eating jellyfish and getting massages, this behemoth offers clues to life in the open sea. TT: It’s the world’s heaviest bony fish. It’s in the same order as puffer fish and porcupine fish, but it’s one of the most evolutionarily derived fishes in the sea. So, it has a cranium more like what ours looks like, along with fewer vertebrae; its spinal column is actually shorter than its brain. And they’re one of the most fecund vertebrates in the world; a 4-ft female was recorded as having an estimated 300 million eggs. It’s unknown because they’re not commercially targeted. And as adults they don’t school; younger ones will, but as adults they become loners. So we don’t really know the status of their population. We’ve been tagging them all over the world. They’re very vulnerable to fishermen’s nets, they get caught in huge numbers [because] they spend a lot of time lying around on top of the ocean. Some of our data is on whether that’s having an impact on their population. There are inklings that it is. That’s something we’re working on right now, understanding the global population. They have a huge range. They live in all tropical and temperate oceans, up farther north than the Arctic Circle, and all the way down by Cape Town in South Africa. The only way to understand [the sunfish] is to study its ancestry. Their design has evolved to be more like an armored tank with a stiff body as opposed to a streamlined torpedo body like other fish. They just look like big puffer fish on steroids. They use mostly their fins for propulsion as opposed to wagging their body. They’re not dangerous to people. They will bite if you’re harassing them, but they’re actually very gentle in nature, very passive. They look lazy, but they’re really industrious. They dive up and down as much as 40 times a day. We recorded them off the Galapagos Islands diving as deep as 1,100 meters [3,600 feet]. They’re actually the world’s largest jelly-eater. And people love the sunfish, it’s a lot of people’s favorite fish. There’s poetry, folklore—you can even adopt them. Rene-Robert Cavelier Sieur de La Salle was the first European to travel the Mississippi River south to the Gulf, claiming all the land along the Mississippi and its tributaries for France in 1682. In 1685, he sailed from France with more than 300 colonists aboard four ships, La Belle among them, to establish a settlement at the mouth of the Mississippi. Over 300 years ago, the ship of a French explorer sank in the Gulf of Mexico, ultimately destroying France’s hopes of inhabiting what is now Texas. Texas A&M University researchers are now in the same uncharted waters as they are attempting to rebuild La Salle the explorer’s ship by using an enormous freeze-dryer. This is the first project of its size. The ship, La Belle, will be placed in a continuous 60 degrees-below-zero climate; this should successfully remove all the moisture from the European oak and pine timbers and planks. The freeze-dryer is located at the old Bryan Air Force base, near College Station, and is 40 feet long and 8 feet wide — the biggest machine of its kind in North America devoted to archaeology. After this step is complete, the almost 55-foot vessel can be rebuilt. The supply ship was built in 1684 and sank two years later in a storm on Matagorda Bay, about midway between Galveston and Corpus Christi, reports the Washington Post. Researchers and others involved in the project believe that this is an imperative piece of Texas and American history, as well as a great piece for the study of ship architecture. It has been determined that the frames on La Belle were marked specifically by the French craftsmen so the wood comprising the hull could follow the complex curve of the ship, exhibiting lessons of The Enlightenment. After moving inland, the explorer never made it out of Texas; he was murdered by his own men. Marine archaeologists from the Texas Historical Commission discovered the wreck in 1995 under 12 feet of water, ending a decade-long search. A dam was then built around the site as the recovery process was launched. As divers explored the well-preserved La Belle in the Gulf of Mexico, they uncovered items that included swords, cannons, goods for trade, and even a skeleton. After being transferred to Texas A&M, the wood has been since kept in a chemical solution to keep it firm. The freeze-dry process was decided on after oil and chemical prices increased; it is more economical and would cut the preservation timeframe. So, the hull was disassembled and the wood was categorized and digitally scanned so that they could make molds of its original shape, the Washington Post describes. The La Belle rebuilding will begin in late 2013 at the Bullock Museum, where it will remain as the centerpiece. Adventurer Jason Lewis became the first person to circumnavigate the globe using only human power this year when he completed his Expedition 360 after 13 years of travelling. He explains some of the considerations behind crossing the Atlantic by human power with his his pedal powered boat Moshka, in particular the winds and currents, the same used by early explorers such as Ferdinand Magellan and Christopher Columbus. In 1519 Portuguese explorer Ferdinand Magellan set out on an ocean voyage with 5 ships and a crew of 270 men. 2 years later, Magellan was killed by Philippine tribes. In fact, only 18 seamen led by Juan Sebastián Elcano would make it back, becoming the first to complete a true circumnavigation of the earth with the ship Victoria in 1522. Jason Lewis human powered route imposed on a regular map and a mirror map to show that the antipodes have been reached. It would take another 500 years before a human-powered world circumnavigation was repeated. On October 6, 2007, US resident, British Jason Lewis crossed the Greenwich Meridian Line for a second time since July 12, 1994. 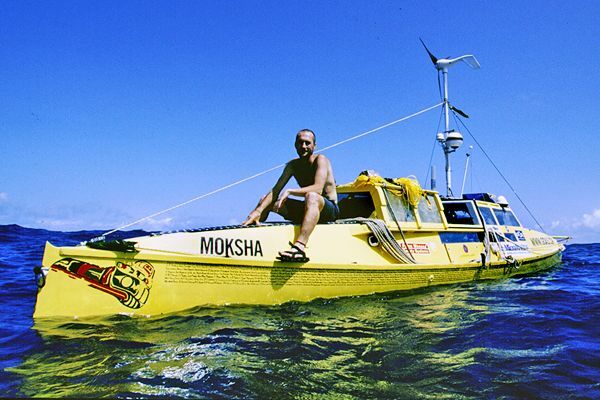 He had traveled around the entire planet - without wind or motor assistance, at times pedaling a one-of-a-kind boat 'Moksha' (liberation in Sanskrit) across the world's oceans. Magellan's trip extended over 3 years. Jason's took 13, in parts because to fund his adventure, he took odd jobs such as cattle driving in Colorado or working in a funeral parlor in Australia. But he always returned to the exact point where he had left off, and continued his way around the world on his own steam. Jason Lewis’ achievement resulted in the publication of the print and electronic copies of Dark Waters, the first in The Expedition trilogy chronicling the first human-powered circumnavigation of the Earth. He survived a terrifying crocodile attack off Australia's Queensland coast, blood poisoning in the middle of the Pacific, malaria in Indonesia and China, and acute mountain sickness in the Himalayas. He was hit by a car and left for dead with two broken legs in Colorado, and incarcerated for espionage on the Sudan-Egypt border. The first in a thrilling adventure trilogy, Dark Waters charts one of the longest, most grueling, yet uplifting and at times irreverently funny journeys in history, circling the world using just the power of the human body, hailed by the London Sunday Times as "The last great first for circumnavigation." But it was more than just a physical challenge. Prompted by what scientists have dubbed the "perfect storm" as the global population soars to 8.3 billion by 2030, adventurer Jason Lewis used The Expedition to reach out to thousands of schoolchildren, calling attention to our interconnectedness and shared responsibility of an inhabitable Earth for future generations. 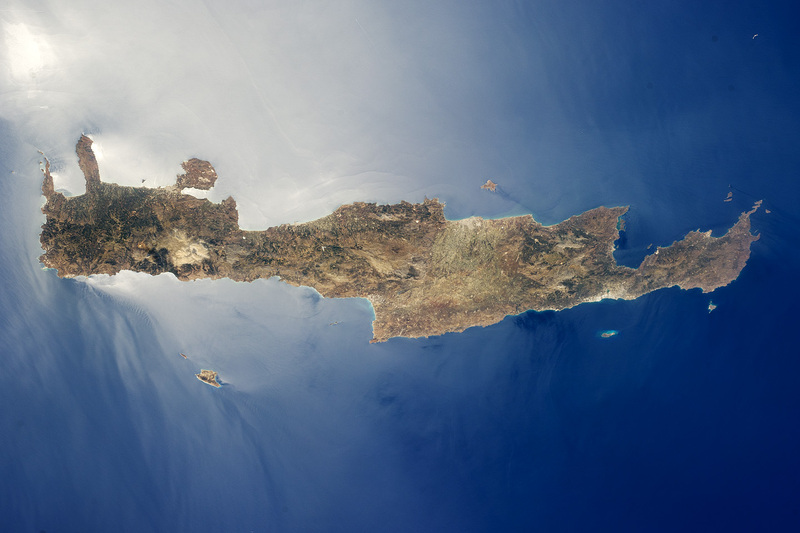 Today, Crete is the largest and most heavily populated island of Greece (or the Hellenic Republic). The island stretches approximately 260 kilometers (161 miles) from west to east, and it is roughly 60 kilometers (37 miles) across at its widest point. The rugged terrain of Crete includes mountains, plateaus, and several deep gorges. The largest city on the island, Heraklion, sits on the northern coastline.